I’m just going to start. Here. I was home Sunday night with nothing to do. Mostly because I am in between projects, and the two men in my life were busy with other commitments. So I start flipping through Amazon Prime Originals looking for a free movie with my Amazon Prime Membership (gag). I had already finished the entire series of The Marvelous Ms. Maisel (remind me to talk separately about this one), plus all six episodes of Fleabag (love the “break the fifth wall” POV on this one), when I ran into something completely off the beaten path (yes!). And now. I am a little obsessed. The Author JT Leroy Story. Everyone, you have to watch this! This is one of the craziest “literary hoax” stories that’s been ever recorded. Some people call it a hoax, I call it an unforgettable experience, it’s like watching someone playing God. 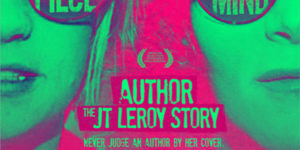 This is the story of Laura Albert, who decided to write under the fictional character/pseudonym of JT Leroy, a teen trans prostitute who is addicted to heroin. Both of JT Leroy’s Books rose to fame (Sarah, The Heart is Deceitful Above All Things.) and then Laura Albert had to get really creative. This documentary, told by “the author of the author”, Laura Albert, will keep you tied to your screen. All two hours of it. I want to give this one 1000% Rotten Tomatoes, is that possible?